Yes friends, our favorite Ghost Centipede Dragon Pokemon is back! With a new look! In the video games, Giratina would take on its Origin forme whenever it was in its home Dimension, and it’s altered forme in our world. Niantic has chosen to treat these functionally as two separate Pokemon, much like Castform and Deoxys. Giratina – Altered Forme didn’t shake things up too much, but let’s check out Arceus’ craftsmanship and see if this version is any different! Giratina – Origin Forme will come to raids April 2nd at 1pm Pacific Daylight Time and leave raids on April 29th at 1pm Pacific Daylight Time. What Good is this Pokemon? Amazing Damage: #3 against the entire field with a 85.4% win rate using Shadow Claw, second only to Giratina Altered Form. Hard to Counter: #2 against the top 24 Well Rounded Pokemon second only to Dialga using Shadow Claw. Has favorable matchups against most of the top Pokemon. Shadow Claw helps against Melmetal in particular making it almost a toss up. Expensive: Needs a ton of candy but then everything in Master’s League does. Typing: Unusual Resistance to Normal and Fighting attacks. No Double Weakness thank Arceus. Respectable Damage: Roughly equivalent damage to Latias. Gym Clearing: All of the Above reasons are great for Gym Clearing, and no other Dragon has all of those specific advantages together. Expensive: as a Legendary Raid Boss, candy doesn’t come cheap. 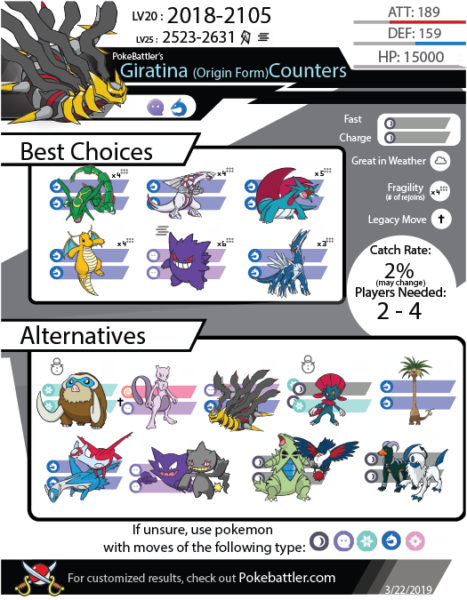 Outclassed: Giratina is just as expensive to get candy for as Dialga, Rayquaza and Palkia – all of which generally perform better than it in terms of damage. Even lesser Dragons like Latias and Latios have higher damage. Limited Niche: While its resistances to Normal and Fighting put it apart, those are very uncommon movesets to find on Dragon-types. No relevant Dragon types in GO currently do any sort of meaningful Fighting or Normal Damage. Typing: Takes extra damage from Ghost and Dark type attacks. This hurts it against itself, and if Salamence ever becomes a raid boss. Durability: It’s out first tanky ghost! Damage: The next two best ghost attackers (which are inferior in bulk) are both only comparable to it with legacy movesets. He is holistically the best Ghost type attacker now. Typing: Takes extra damage from Fairy Dragon and Ice type attacks. This hurts it against itself, and if Salamence ever becomes a raid boss. Also for usage against Latios and Latias. Sometimes going off the road has advantages. Dragon Tail Shadow Ball – Best moveset if you want to use Giratina against Giratina! When a Pokemon is weak to both Ghost and Dragon, this moveset has a noticeable edge, but Shadow Claw is close. Giratina is fairly standard for a tier 5 boss in terms of difficulty, taking between 2-4 players if they have enough OK counters or max revives. Unlike most dragons so far, it lacks any double weakness–but in exchange, it has a diverse set of weaknesses. Its duel typing doesn’t negate any of its weaknesses, leaving it with 5 total. Fairy, Ice, Dragon, Dark, and Ghost. There is not much variance in what counters to use against Giratina based on moveset. Dragons are generally powerful enough to endure Dragon Pulse and Ominous Winds is pretty unimpressive against Ghost Types. Shadow Ball Hits ghost types super effectively but resisted by dark types. Knocks Gengar clear out of the counters list. Ominous Winds Hits ghost types super effectively but resisted by dark types. Hardest moveset. Dragon Pulse: Hits Dragons super effectively. I have no Counters, what do? Dialga/Palkia/Rayquaza were all recently in raids, if you have any with Dragon Charge moves, they are usable in a 3 man. Mamoswine was recently in a community day, if you have any with Avalanche, he is usable in a 4 man. Giratina is great too if you snag some of these, you can use any with a Dragon Charge Move. Currently, Tyranitar, Shiftry, Absol, and Alolan-Exeggutor are in raids. All of which are perfectly serviceable counters against Giratina – Origin. Giratina – Origin can be beaten by 2 players in optimal weather, with max friendship and perfect level 40 counters or by 4 unfriended players using level 20 counters from this guide. When caught, Giratina – Origin will be between 2018 and 2105 CP without a weather boost. In Windy or Foggy weather, Giratina – Origin will be between 2523 and 2631 when caught. Rayquaza is the best counter against Giratina for all of its movesets. It has only been available for a single weekend in the last year-but that weekend happened to have been this month. So if you were lucky enough to snag some here is the first payout! Second fiddle to RayRay! Palkia actively prefers Ghost Movesets to other movesets, with it being a little vulnerable vs. Dragon Movesets. A very solid choice but can have issues with energy waste with the inferior single bar move Draco Meteor. Dragonite’s angry uncle! Draco Meteor is less consistent than Outrage, and Dragonite has gotten a lot more chances to be accessible than Salamence, but it’s still great. Requires 3 players with the Pokemon at level 35. Having lost it’s #1 dragon spot for Damage and Bulk, Dragonite is still very good and if you’ve been playing awhile you are more likely to have a high-level one than the other Dragons. Don’t worry if you don’t have Shadow Claw, all of Gengar’s fast moves are perfectly usable as long as you have Shadow Ball. Very frail though, either stock up on a lot of max revives or place him in the lead of your party. This allows him to do damage with the most survival time. Gengar also becomes the number 1 counter in foggy weather. Beware of Shadow Ball Giratina however, it absolutely slaughters Gengars usefulness. Dialga is overall the best counter in terms of Total Damage Output, and only a bit behind the other top counters in terms of damage. If you want to be efficient on revives and don’t want to have multiple teams or revives, Dialga is your best bet. In Snowy weather, Mamoswine becomes the #1 counter. Nice to start seeing an Ice type that can challenge the other big bois of other types. Predictably Mewtwo jumps from #8 to #2 in foggy weather, but it requires a legacy moveset of Shadow Ball. Fun moveset, although less usefulness than many other dragons at this point sadly. Weavile is delightful because as long as you don’t get Focus Blast, all of its movesets are fantastic with strong performances. 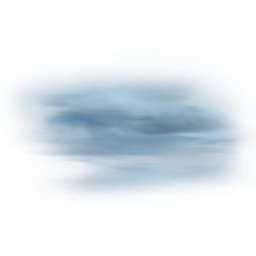 In Foggy and Snowy they become top tier with the respective movesets as well. Weavile is also bulkier than you might have expected as its appearance can be deceiving. Top Tier bulk matching Dialga, although slightly less impressive bulk. In earlier generations, he would be stomping much higher on this list, but a lot of competition has come out above of late. A bit more bizarre, but Rampardos manages to pop his head in as an okay Dragon type. Its only fair after all the Dragons that topped the counters list for types they didn’t even have an advantage against. Funny that we used to dislike Murkrows so bad they were the theme of an April Fools event. Latios’ bulky sister, none of Giratina’s attacks are too scary for one hit KOing, so its extra bulk doesn’t provide much advantage. Poor man’s Gengar, you would need a whole lot of revives for this one though. Absol has fallen down the Dark type ladder in gen 4 quite a bit and is a pain to get candy for, sadly. But they are beautiful Pokemon and serviceable. Meme-ers rejoice, if you want to do an Alolan Exeggutor trio there is nothing to stop you from doing so! While his weakness to rock is non-ideal, you are more likely to have a high-level Houndoom verses an Absol. Haunter lives up to his typing–if you want to use him expect to die a lot. This thing dies more than Sharpedo, the very definition of a glass cannon attacker. If you have legacy Shadow Claw or Lick on him, however, you can *theoretically* pull off a duo with him in foggy weather. Whether any of you have the resources (aka are named Kieng) and the luck to get the Foggy weather to pull that off, is another matter. Alakazam finds himself on this list due to his fantastic attack stat and Shadow Ball just being phenomenal. Mr. Chompers is another Glass Cannon that has slipped down the rankings. While Jynx is pretty low on this list, that speaks more to how polluted with fantastic options we have at this point. In gen 1, Jynx would have been our 6th best counter here! Dark fast moves are nice here. There is no fairy-type fast attack, so whether a fairy is good in a situation relies a lot on what fast move it happens to have. It manages to nudge slightly ahead of Gardevoir due to no Psychic duel typing to be weak to Ghost. Hopefully, no one tells Granbull that every single fairy attacker ranks lower than Haunter. While Giratina’s new look doesn’t top any PvE charts, it’s superior to its previous form for raids for sure, and a welcome addition to the options we have for Dragon attackers. As a PvP attacker, Giratina Origin Forme is top notch, right next to its other form. If you ever think you would ever be interested in PvP, collect a Giratina now while its available. You won’t regret it. While Giratina will be tough to take down, many of its best counters have been featured by Niantic very recently, so hopefully, you can put together a strong team with some trading and coordination to beat this interestingly typed Legendary.